The lymphadenoid tissues in the upper airway are relatively organized lymphoepithelial structures that play an important role in protecting the upper airway against foreign pathogens. The importance of the presence of lymphadenoid tissue in humans was recognized as long ago as 1884 by Waldeyer, who described its specific arrangement as a “ring” of lymphoid tissue, now termed as the Waldeyer’s ring. The palatine tonsils are major components of the lymphoid tissues contained in the Waldeyer’s ring and appear to function as the host’s first line of defense against exogenous microorganisms and other potential air pollutants and allergens. 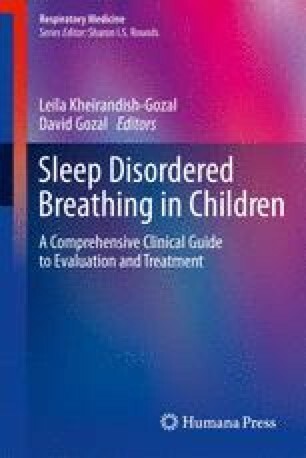 Since its initial description, obstructive sleep apnea (OSA) has emerged as a highly prevalent condition in the pediatric age range, and adenotonsillar hypertrophy has been recognized as the major pathophysiological contributor of OSA in children and also plays an important role in another frequent condition in children, namely, recurrent tonsillitis (RI). Therefore, in this chapter, we summarize the current cumulative evidence on the histological and pathological features of human lymphadenoid tissues, delineate their fundamental immunological functions, and provide insights into various interactions involved in the initiation of immune responses, such as to enable a better conceptual framework on the pathophysiology of pediatric OSA.